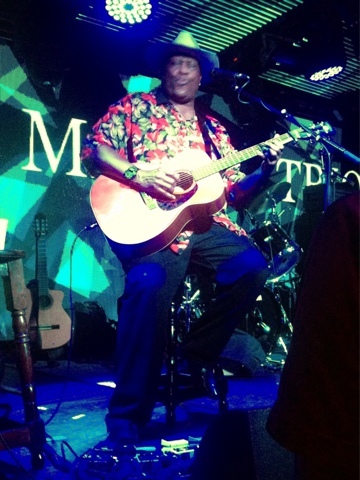 The second time of seeing Taj Mahal at Under the Bridge. Unfortunately Mary was not able to go as work sent her to Jo'berg and she had to leave at 4:30pm on Sunday. Nigel and Kate stepped in, bought the extra, odd ticket and kept me company for the gig. Nigel and Kate wanted to be down in the mosh pit so I ended up right next to the stage with a brilliant view of the man. Like last time, he played a number of old favourites and switched between several different guitars, a banjo and keyboards - the latter to a good humoured shout of "show off!" No support act. He came on about 8:20pm and played for over two hours solid, no break, just non-stop entertainment. "The gravel-voiced singer, banjo player and undisputed US blues great has got his act well and truly together" says The Evening Standard. I'll second that. Yet another fine musical evening in old London town.